A sample PHP application is available that retrieves the names of the first 10 members and displays them on an HTML page. To view the code for this application, click here. The application consists of two files: WaApy.py, which communicates with Wild Apricot's API, and ApiTest.py, the demo application that performs the above functions. To view these files, click here. A sample Visual Studio project is available that performs the following functions using Version 2 of Wild Apricot's API. The Visual Studio project is written in C# and uses the Newtonsoft.Json assembly. To view the code for this project, click here. 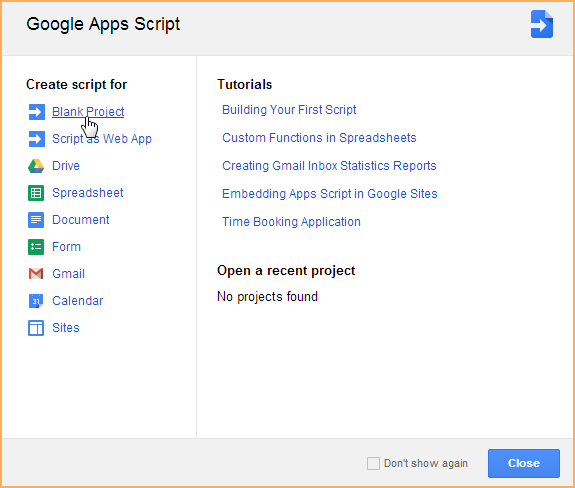 Within Google Drive, create a new spreadsheet. Click the Tools menu and select the Script editor option. Select the option to create a blank project. Copy the sample code and paste it in place of the sample code within the script editor. The sample code retrieves account details but can be modified to perform any function supported by Wild Apricot's API. Click the icon to open the current project's triggers. Set up and save the following trigger. Close your Google spreadsheet and open it again. Enter the following field labels. Click the Wild Apricot menu and select Get account details. 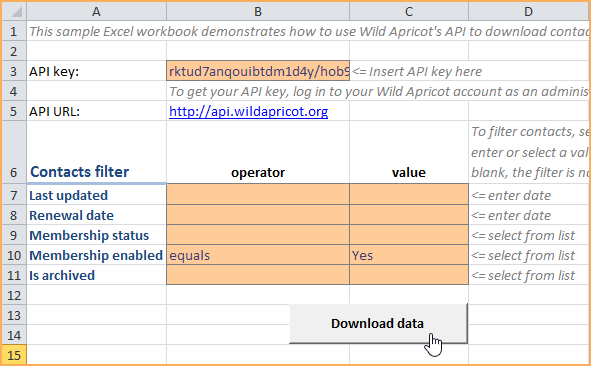 To help get you started with Wild Apricot's API, we have provided a sample Windows Excel file that uses API calls – programmed with Visual Basic – to download contact records and other information from a Wild Apricot account. The Excel file provides parameters that you can set to filter the results. You can use this file as is without any further programming or you can modify it according to your organization's requirements. To download the sample Excel file, click here. Log into your Wild Apricot account as an administrator, find your API key, and copy it to the clipboard. Open the Excel file in Excel. 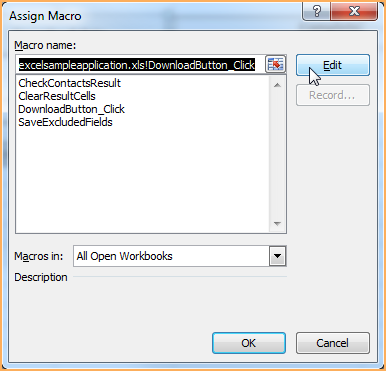 If you encounter errors opening the file, enable macros for this file or in your Excel options. On the Settings tab, paste your API key into the API key field. Click the Download data button. Account information will now appear on the Settings tab. Contact and membership fields will be downloaded to the Fields tab. Membership levels will appear on the Levels tab. Contact records will be downloaded to the Contacts tab. Pivot charts will appear on the Sample Report tab displaying the number of contacts for each combination of membership level and status. Click the operator cell beside the filter criteria you want to use and select an operator from the list. Select a value from the value cell. Do not type the value yourself. The value will be combined with the operator to form the search criteria. For example, to retrieve only records with an active membership status, you would select the equals operator and the Active value from the Membership status row. When you are finished setting filter criteria and ready to download your contact records, click the Download data button. Your filtered results will now appear on the Contacts and the Sample Report tab. After entering your API key, click the Download data button on the Settings tab to download your account data. From the Fields tab, you can prevent fields from being included in the results by clicking the cell under the Include in search results? heading and selecting No from the list. After you have chosen the fields to be included in the search results, return to the Settings tab. Click the Download data button again. Your search results will now be displayed on the Contacts tab using only the selected fields. Right click over the Download data button. Select the Assign Macro option from the dialog that appears. 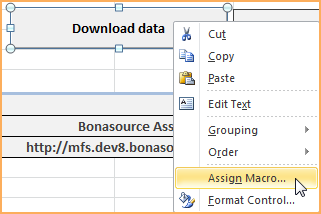 From the Assign Macro screen, select the DownloadButton macro and click the Edit button. Visual Basic for Applications will open, and display the DownloadButton macro.